31 Days of Mehron Halloween Global Challenge 2018! Tis the Best Season of all!! It’s time for Mehron's Halloween Contest where we search for the best artists from around the world and feature them on our website and social media channels. Each and every day of October we will be selecting a FINALIST from all submissions to date. Finalists will be announced on a special page of our website and IG Page. Once the 31 Finalists have been selected, the contest team at Mehron Corporate Headquarters will evaluate each Finalist and select the 2018 Grand Champion. This year the overall w inner will receive amazing Mehron Products, a spotlight feature on Mehron’s website, blog and social media platforms, and a $1,000.00 CASH PRIZE! It’s time to get creative and show off your makeup talents! Follow @MehronMakeup and Repost the original “31 Days of Mehron Halloween Challenge” Instagram post, tagging @mehronmakeup, #31daysofMehronhalloween, and #mehronmakeup. Post a high-resolution image of your original Halloween makeup look (multiple submissions are allowed of past and present makeup) and tag and hashtag same as above. Make sure your image is clear and of the highest resolution. Blurry or low-resolution images will not be accepted. List the Mehron Products used, along with a short description of your Halloween character and the inspiration for your look. Multiple submissions are allowed. Resubmission of past makeup looks are acceptable. If selected as a Finalist you will be sent the Mehron Release Agreement allowing us to showcase your work. If a model and/or photographer is used, a separate Mehron Release will be required from each. Finalists will be contacted in advance for full bios, social media links, high resolution image, and the Mehron Release Agreement. An immediate response is needed. Submissions can begin now. The Finalist announcements will begin October 1st and end October 31st. The 2018 Grand Champion will be announced on 11/3. The contest is open to international artists. 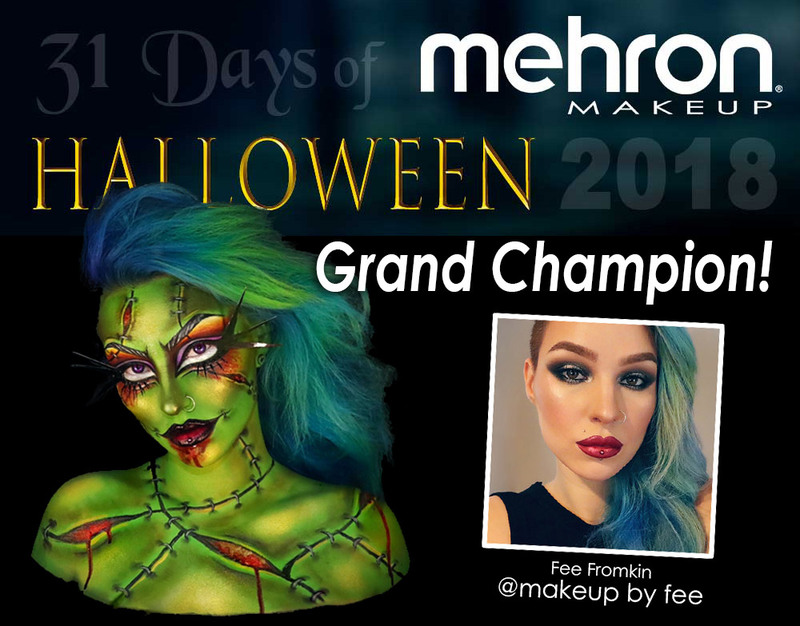 The Grand Champion will receive $1,000.00 (USD) and an Ultimate Mehron Makeup Kit filled with an array of Halloween, FX, Beauty and Performance products. Q. When can submissions begin? A. Submissions can begin on the day the contest is posted on Instagram. For 2018, that date was September 24th. Q. Is the Finalist selected only from submissions on that day? A. The Finalist are selected from all submissions received up to that date. This gives the best artists the opportunity to be selected when several great submissions occur on the same day. It also prevents an artist from submitting the same work over and over again every day of the contest just to be selected for that day. Q. What criteria is used to pick the daily finalist? A. We use several criteria when selecting a finalist. Some of these include: creativity, artistic complexity, Mehron products used, design diversity from other finalists, and adherence to contest rules. Q. Can private Instagram accounts enter? A. No, all accounts must be public in order to view entries.